I was thinking this morning..... about the many types of lie. No, I do not subscribe to lie in any shade and colour, but have seen people dress up 'lie' in different garbs. I am sure you must have heard of 'white lie,' which according to the dictionary is a lie with good intentions. I was wondering why anyone with good intentions should tell a lie. If a lady asked 'how do I look in this dress?' and you tell her she looks good when she doesn't, it is a lie and there is nothing white about the lie. But wait a minute, if there is white lie, is there black lie? According to the Urban Dictionary, when a black person gets blamed for a white person's crime, it is called 'black lie.' Na wa for oyibo people, always giving the black man the short end of the stick. Never in our favour. Melodious lie, white lie, funny lie, bloody lie or fat lie, the one common denominator is that it is a lie. The NIV translation of the Bible in John 8:44 speaking about the devil says, 'when he lies, he speaks his native language, for he is a liar and the father of lies.' That means the devil tells 'native lies.' Though our leaders and politicians have perfected the art of telling native, diplomatic, executive and legislative lies, please do not join them to normalize this anomaly. Let your no be no and your yes be yes. 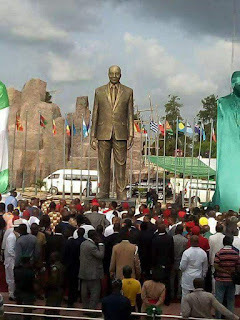 I was thinking this morning... As I followed the major news item this week of Governor Rochas Anayo Okorocha of Imo state, unveiling a 25m statue of South African president Jacob Zuma, when workers have not been paid salaries for months, I shook my head in disappointment. I was wondering how a man that is suffering from integrity-deficiency in his home country could be so deified by a man that should be an apostle of good governance. As I read the words of a South African that said 'Instead of a statue, Nigeria can keep the real thing,' I concluded that we have again made a confident error of judgement. Yes, a confident error of judgement it must be, as I remembered a gist of a man those days standing at the newspaper shop to buy his favourite newspaper. The newspaper agent had noticed his loyalty over time and on this day asked him, 'why do you like reading our newspaper?' The man thought for a while and replied calmly in pidgin English, 'Ehn, the thing plenty,' he hesitated and then added 'and e soft.' Hmm!!! While the newspaper agent thought they had the best news stories, little did he know that the man's motivation for buying the newspaper was not to read but to use as toilet paper. Oh, it was a confident error of judgement on the part of the agent. Have you been confidently wrong before? Think about it. I know of many friends that supported many elected officials in the past and present governments including many of their appointees. When stories broke about some of the atrocities committed, with one scandal following another, they defended them at first, but later dropped their heads in shame from overwhelming evidence. Some of the people that many judged to be above board had 'fallen our hands.' Most of us were confidently wrong in our judgement. We have realized that the purpose of their getting into government was not to serve but for filthy lucre. Just when I thought this was a curse on politicians, I read the news of the Kwara state Commissioner of Police, Lawan Ado, redeploying policemen at Adewole Police Division in Ilorin over allegations that some of the officers have been selling suspects detained at the station to ritual killers for N80,000 per person. Oh God, what has become of man? While many will see the police station as a safe place to hide away from the rampaging ritual killer, this story will make many think again. It is a confident error of judgement. I was thinking this morning.... about colours and how it has evolved in Nigeria. If you think you are familiar with colour types, pick up Nigerian wedding invites and test yourself. A colleague invited me to his daughter's wedding and as I read the invite, I saw 'Colour of the Day; Aqua/Fayrouz Green.' 'Which one be Aqua/Fayrouz Green again na?' I had quipped. As I soliloquized, I recalled watching a Nigeria movie, 'Dance to my beat,' recently where the colour for the wedding was 'Champagne gold.' Trust me, when I heard 'champagne gold,' I struggled to picture what it will look like. The way we are going in Nigeria, we will soon establish our own colour scheme. 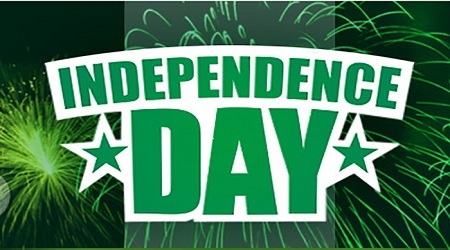 Haba naija!!! Until my adult life, I never knew that there were other colours aside from the basic primary and secondary colours we were taught in school. Since I started receiving wedding invitations, I now know that we have tertiary and now Nigeria colours. But wait a minute, why have we chosen to depict our colours with food and drink instead of using the actual names? Could it be sheer laziness to find out what the shade of colour is called or our proclivity for 'owambe' or 'igbadun?' 'Think Party, Think Food and drinks!' Is the colour description meant to give an indication of what to expect at the event? Maybe. When the colour is Aqua/Fayrouz green, expect lots of water, Fayrouz and other soda drinks, but when it is champagne gold, you know what to expect. I found out that the colour my friend called Fayrouz green could either be Lime, Pear, Chartreuse or even Parakeet and what they call champagne gold could either be Blonde, Daffodil or even Dandelion. If you think about it deeply, you will not blame Nigerians for being creative. Imagine reading the colour of the day in an invite to be 'Chartreuse or Parakeet,' how on earth will one know that it is a shade of green? Yes it is creative associating the colour to something everyone is familiar with, my only grouse with our choice of description is that some are too elitist. For example, how can a typical waffi man know what champagne gold looks like when he has never drank champagne before? Instead of saying 'champagne gold,' why don't they say 'Chinchin gold?' They can also use 'Alomo Bitters red,' 'Dogonyaro green,' 'Indomie cream,' 'Coca Cola black' and so on. 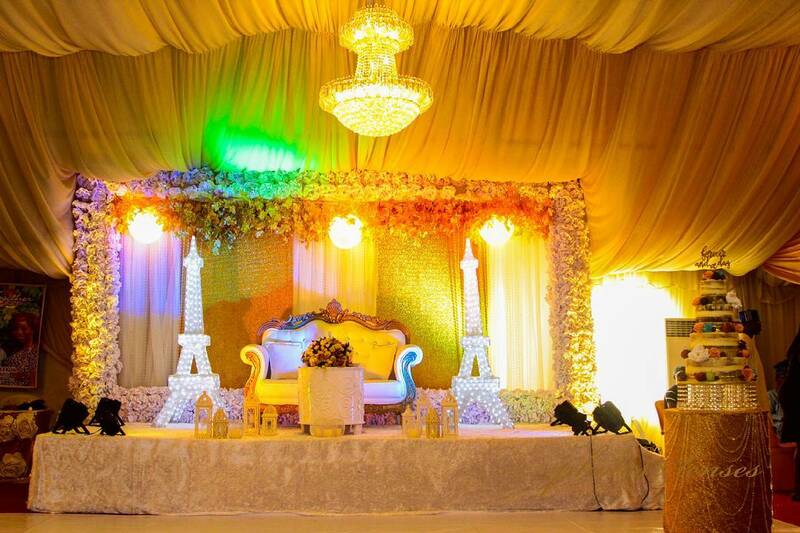 Another challenge I have with our brand of colour scheme creation is that it feeds the 'aso-ebi agenda.' All I can say is that it is well. As I continued to scratch my head in confusion, I recalled a true story a doctor friend, now retired, told me. He had mentioned that some years ago, an expat arrived the organization to resume as a staff supposedly under 60 years, though his looks said otherwise. Like we do in Nigeria, he decided to give him a warm welcome with a vigorous handshake. To his chagrin, the man's hand dislocated from the shoulder. At this point the expat confessed to being in his late seventies. Hmm!!! He must be a member of the youth wing of the elders forum. You know, I have always wondered when that common saying in Nigeria, 'the youths are the leaders of tomorrow' will come to pass. Little did I know that it is already being fulfilled. I found out that the average age of the current Federal ministers is 55 years, with the youngest, Abubakar Malami and Kemi Adeosun being 50 years and Audu Ogbeh, the oldest being 70 years. Hmm!!! Look at the current Senate. Of the 109 seats, there is no senator below 40 years of age. Dino Melaye is the youngest at 42 years and Shaaba Lafiagi the oldest at 76 years. What is clear is that with 83 of the senators (76%) aged between 50 and 70 years, don't make the mistake of thinking the majority of our leaders are elder statesmen. No! No!! No!!! They are simply members of the youth wing of the elders forum. 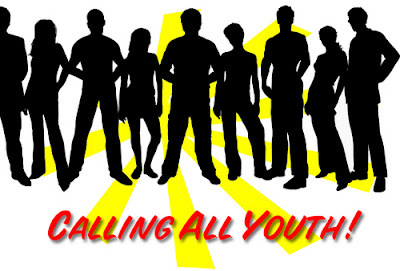 I am not sure what the motivation is for an elder to lay claim to being a youth or whether there is a demographic called youths, but whatever it is, something ain't right, like the Americans will say. Joel 2:28 says, 'And it shall come to pass afterward, that I will pour out my spirit upon all flesh; and your sons and daughters shall prophesy, your old men shall dream dreams, your young men shall see visions.' But the way it is in Nigeria, it is the old men dreaming dreams and seeing visions, while the young men are either sleeping and snoring or helping the old men achieve their dreams. Youths, wake up and be truly youths. I was thinking this morning..... about Independence Day. I woke up this morning with smiles recalling how as students in the early eighties we looked forward to Independence Day. How with freshly washed and ironed uniforms, we all troop to the Warri Township Stadium for the Independence Day match past. Oh, we took every step with great expectation of a glorious future for our nation. Today, 57 years after we were granted independence, we are still grappling with potty training issues. At a time when only last Monday, Dubai launched the world's first self-flying taxi, we cannot even boast of a decent taxi on a decent road, instead our own pacesetter state was donating 1000 power generators to the Nigerian Police. Oh God, where did we get it wrong? As I sat by the edge of the bed lost in thought, my mind drifted to my 57 years old colleague getting ready for retirement. With his children out of university, he was ready to step aside, confident of facing what lies post-retirement. But why is Nigeria still a baby at 57? Could it be because of bad leaders? Yes. Could it also be because we are docile followers? Yes. As I hung on to that line of thought, I recalled the Ugandan Hon. Fred Mukasa Mbidde of Democratic Party, who in deference to his party position had told the press, 'I have consistently stated that I will not kowtow in their poohoo.' Even as I smiled at his statement, knowing fully well that 'the guy dey learn work where our very own Patrick Obahiagbon is,' I realized how apt a point he has made. We the followers have not only been docile, we have been kowtowing in the poohoo of our past and present political leaders. I know from college that 'kowtow' means to bow down in adoration, and recently found out that 'poohoo' means useless cries of pain made when one is pooing. Think about it, we know the politicians are looting us dry. Looting the money meant for education, health care, power and even our pension. We shout and wail on social media, but when the next thief is discovered to belong to our political party or tribe, we excuse it. We let it go. For the rest of us, these same people return in different garbs shouting on top their voice how they have become politically born-again and now want to better our lives. We vote them in again. Ah, we are kowtowing in their poohoo. Step it down one level. You see parents support their kids to beat the school laws by smuggling contraband into the hostels. Some even go further to support malpractice in schools, because the noise all around them is how the end justifies the means. More and more parents are failing their children because we are no longer the moral and spiritual beacons we are expected to be. Oh, a broken family is a broken nation. We all are kowtowing in their poohoo.